Mozilla Firefox 26 has been released. 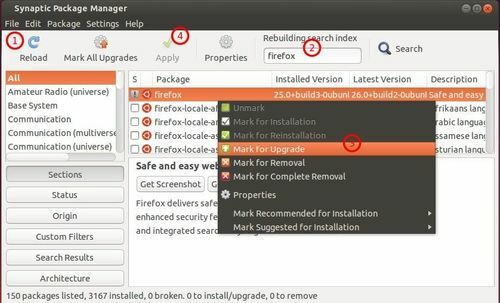 This tutorial will show you how to upgrade it in Ubuntu and this will also work when another new Firefox release is out. 1. Install Synaptic Package Manager from Ubuntu Software Center. 2. Start package manager and click Reload button to refresh package lists. 3. Search for firefox in quick filter box. 5. Click tick button to start upgrading. Done! No user responded in " Firefox 26 released, How to Upgrade in Ubuntu "